The Big Picture School in Camden, New Jersey, MetEast High School, made it through the year setting a very special record. No Dropouts! The loss of children from the system of education is one of those things that most school systems take for granted, as though a few students more or less don't really matter. Big Picture Schools are the brain child of Elliot Washor and Dennis Littky and are reinventing high school education. Their secret? Place children in situations in which they have real hands-on effect on community and environment. Classes are built around the idea that students will learn by following their passions. Students do internships. Graduation requirements include a senior project with the aim of doing some good for the community. And four times a year, every student makes a presentation to a panel that includes students and adults from outside the school. Ask Elliot about the other secret of Big Picture Schools. He will tell you about the hands. You have just a few more hours to vote in the measuring poll at right and I am surprised to see four systems of measurement running almost neck and neck. I should run the same poll again with a couple additional systems thrown in for additional refinement. 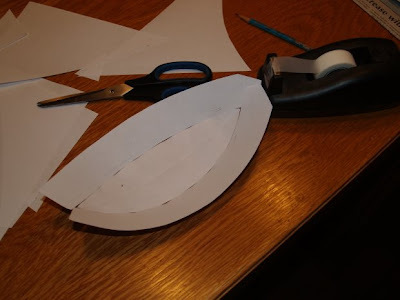 Those would be "seat of the pants" and "trial and error," each of which could be summarized as "keep cutting your parts until they fits and then when they get too short, shrink your project as necessary." Anyway, please vote. I continue in the making of tables by sanding legs. 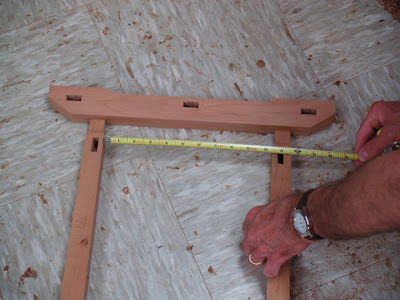 And now that the joints to connect the top stretchers and legs are cut and fitted, I can, as shown in the photo above, take accurate measurements for cutting the lower stretchers to length. 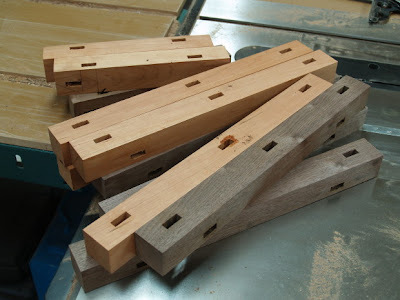 Making these lower stretchers will be my next step. In this photo, you can also see the torii shape that serves as inspiration for the table design. Quote of the day... "We are dulled in wit, diminished in character when our hands are left idle." Cook, plant, sew, make, fix, nurture, nourish, care. The evolution of human culture is in your hands. Isn't it interesting how much of our language was shaped by our having hands? I am shaping the various parts for the tables. In the photos above, I first shaped the top stretchers and then tapered the legs, making them slender at the top. This is the reverse of the design I've been using on my contemporary rustic tables which stand on smaller feet. These tables in contrast, are inspired by Japanese architecture and intended to reflect the design of a torii, gate at the entrance of a shinto shrine as in the Wikipedia image below. 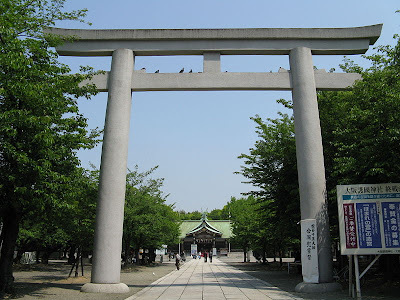 A torii in Japan is used to mark the entrance to a sacred space. We as a society have developed a popular vocabulary of work that leads us to make easy but substantial distinctions between work of body and brain, of white collar and blue—these days expressed as the new knowledge work versus old-style industry and service work. While these distinctions surely have meaning in terms of status and income, they may be less definitive than we think and may blind us to commonalities in the way different kinds of work actually get done at the level of immediate, day-to-day practice. We gain, I believe, a richer appreciation of competent performance, a broader sense of it, by observing, for example, the sequencing and pacing of tasks in a range of both blue-collar and white occupational contexts, or the strategic combining of the senses in service of both the tradesperson's and the surgeon's diagnosis. We engage the world and its wonders, sensing and creating primarily through the agency of our hands. We abandon our children to education in boredom and intellectual escapism by failing to engage their hands in learning and making. We each are diminished intellectually, emotionally and culturally when our hands are left untrained and ill prepared for engagement in physical reality. But there are simple remedies. Cook, plant, sew, make, make music, nurture, care for others through the conscious engagement of the hands. The photo above shows this morning's process on making tables. 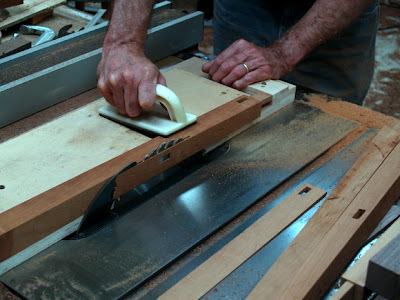 I used a dado blade in the table saw to begin shaping the end stretchers for the table tops. My wife Jean and I spent the weekend at Devil's Den with friends and It was wonderful to be be surrounded by nature and the lasting legacy of the Civilian Conservation Corp through which thousands of young men learned skills and character during the great depression. The CCC served, building parks and planting trees throughout the US from 1933 until 1942 when our young men were sent to war. 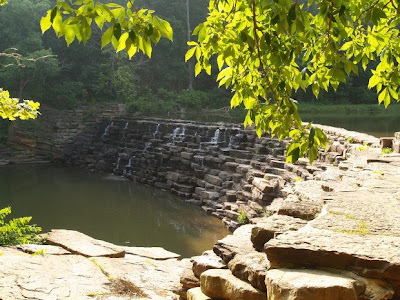 In the photos above, you see the sand stone dam used to form the lake at Devil's Den. 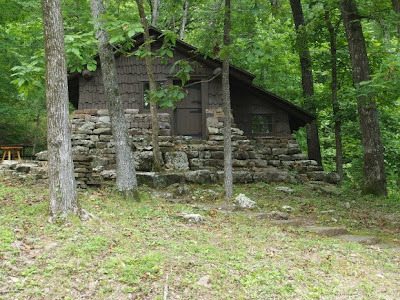 Next is a cabin in the classic CCC style. Each has been modernized for the convenience of guests. The last photos are of the highway 170 overlook. Young men of the time were so proud of this structure on its completion that they felt that if there were a Pulitzer Prize for construction, this overlook would most assuredly win. It is a shame that such honors of hand craft on a par with literature are not bestowed. 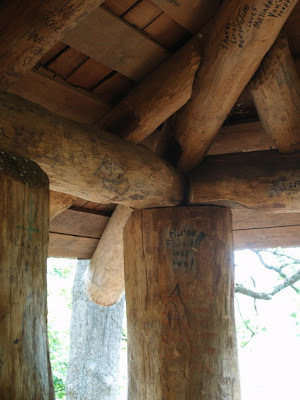 In the structure, you can still see each chisel mark from the tools used to craft it, and each cut required judgment and decisive action, that could not be undone or erased. I wonder what we are doing these days to offer young men the opportunity to earn such pride as these young men felt. In the photo you can see the table top stretcher with mortises complete and routed grooves to house the solid wood top sections. This was done using a plunge router and fence. 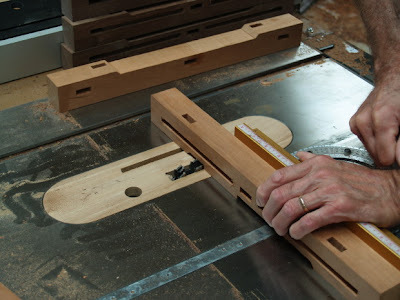 The piece of plywood shown was clamped in place to serve as a stop controlling the length of the routed grooves. 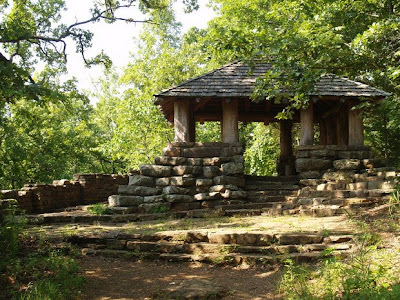 This happens to be the 75th anniversary of the CCC, Civilian Conservation Corp, and my wife Jean (It's her birthday) and I will spend the weekend at Devil's Den, an original CCC camp near Fayetteville, Arkansas in an original CCC cabin. Some of the original camp workers may be visiting this weekend, too, even though many are now nearing 90. While I won't be posting to the blog for a couple days, I will have photos to share on Sunday or Monday. 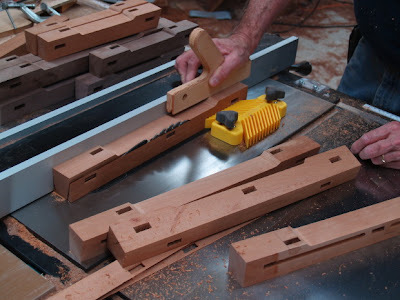 Today, I have been using the hollow chisel mortiser to cut mortises in the top stretchers for the table. In the coming days, I'll rout these for the top panels to fit and give them a more interesting shape. You will find a preview in this earlier post. Matthew Crawford, author of Shop Class as Soulcraft was interviewed last night on Stephen Colbert, and the episode can be viewed on-line. John Grossbohlin sent photos of school projects. 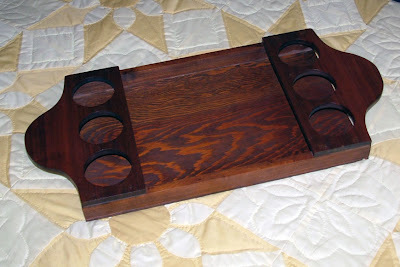 The tray is one he made in shop class in 1971 based on a design shown earlier and that can be found here. 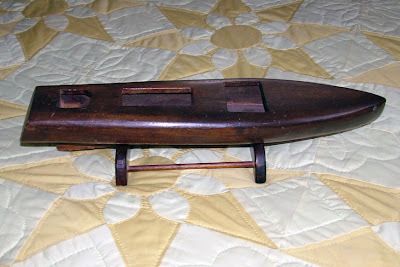 The model boat is one his father made in about 1947. The Wall Street Journal had an article A Wandering Mind Heads straight Toward Insight that may help to explain why the use of the hands induces creative thinking. ...our brain may be most actively engaged when our mind is wandering and we've actually lost track of our thoughts. "Solving a problem with insight is fundamentally different from solving a problem analytically. There really are different brain mechanisms involved." -- Dr. John Kounios, Drexel University. I strongly suspect, based on my own observations that engagement of the hands will be discovered as one of the primary components of creativity, perhaps related to changes in brain wave state. And of course that may be why many or most religious disciplines utilize particular hand gestures to induce contemplative states. Unfortunately, however, we have created a culture in which the role of the hands in the expression of intelligence is marginalized. As you can see in the photo, I have been forming the tenons on the ends of the legs. 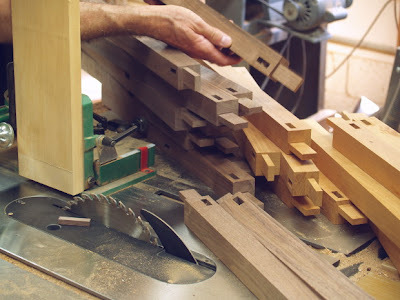 This is an operation that can get confusing because the tenons are offset to allow for the legs to be tapered toward the top, and because they are in pairs, left and right. Cutting on the table saw, rather than by hand speeds the process up increasing the chance of error. I goofed one up and had to make a replacement. But it is good to do work that demands your attention and that calls you back to the moment when your attention wanders. In Zen, it might be called mindfulness. In woodworking, it is called craftsmanship. I have added a poll on favorite ways to measure. If you have things to add, feelings about metric vs. English, leave a comment here. What you see in the photo above are legs for 6 tables. Each now has mortises cut for fitting the stretchers that give it structure. Next, I'll cut mortises in the top stretchers and then cut the top tenons at the end of each leg. In the photo below you can see some of the work going on at ESSA this week. 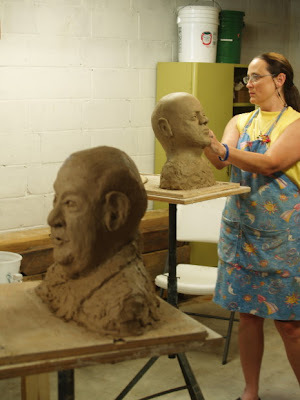 Lowell Baker, a friend who teaches at the University of Alabama is here for a week long sculpture class, and some of his students are making busts of old men. For photos of last week's watercolor class visit the Eureka Springs School of the Arts Blog. "Now the moral side of an industry, productive or unproductive, the redeeming and ideal aspect of this bread-winning, is the attainment and preservation of the highest possible skill on the part of the craftsmen. Such skill, the skill of technique, is more than honesty; it is something wider, embracing honesty and grace and rule in an elevated and clear sentiment, not altogether utilitarian, which may be called the honor of labor. It is made up of accumulated tradition, kept alive by individual pride, rendered exact by professional opinion, and, like the higher arts, it is spurred on and sustained by discriminating praise." One of the things you learn from experience is to drop unnecessary steps. Those steps are the ones that build inaccuracy into your work. The elimination of unnecessary steps is why more experienced craftsmen are able to work faster. Usually these refinements take place over time without becoming intellectualized. In fact, I began using this technique years ago, and only due to my interest in the relationship between the hands and brain, have I taken note of it at all. In this case, I am cutting legs to length using a sled. When I was a beginner, I would make a pencil mark on the wood, then align the pencil mark with the saw blade, and then cut. You can see here where the blade consistently cuts into the sled. I first squared one end of the stock, then hooked one end of the tape measure onto the freshly squared end. Next, I slide the stock into place so that the desired measurement on the the tape measure aligns with the cut in the sled. Can you see the importance of this? I have dropped the pencil from my list of necessary tools for this operation. I have saved the time that would have been spent marking on wood. Then, in addition, pencil lines have width that varies during the course of the pencil's use introducing inaccuracy, depending on its state of being sharp or dull. Even if I were to make the mark very precise in alignment with the markings on the tape measure, I would have introduced one more opportunity to become less accurate in my work, introducing effects that will have be be resolved later in the process. The net effect is to waste time at both ends of the operation. If using this technique, remember to lift the tape measure out of the way while making your cut. You won't want to trim it to a useless length. For making many short pieces, all the same length, use the tape measure to set the space between a stop block and the cut line in the sled. The intelligence here, however, is not in my brain, but is built into the habits of hand, based on experimentation, practice and experience. Is this starting to make sense? Yesterday I jointed and planed the materials for table legs, and having freshly sharpened the knives in both the jointer and planer made my efforts particularly satisfying. 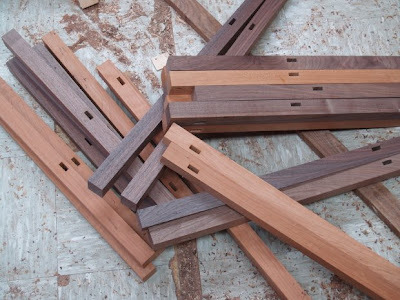 Woodworkers engage in a tactile feedback loop that leads to a sense of empowerment. The wood is rough. Your hands sense the coarse texture of wood. You pass the stock through the tool and it becomes smooth, safe, pleasurable. There are countless numbers of our children who have never been introduced to such things. Those who have not been introduced to shaping materials in their own hands will have no idea what they have missed, and the likelihood of me being able to explain it to them is remote. We put our children's sensitive fingertips on keyboards, shaped to be touch and temperature neutral, manufactured to be smooth from the start, never in years to wear out, or to be transformed by our touch. Wood, on the other hand, may come to us rough, but in time and in use it becomes smooth to our touch. The awakening of the senses to transformation of tactile qualities through touch is essential to complete human development. The sense of control that fosters feelings of well-being that forms the first line in our defenses against depression comes from such simple things as feeling texture move from coarse to smooth. But we can take pills for that can't we? Why bother with crafts? I'm reminded of the grandmother who told me she bought her grandson woodworking tools, a saw, hammer and plane. The child's mother wouldn't allow the tools in the house. He might make a mess or damage something and be noisy. So you can see that there are people in our culture who have no understanding of the hands, the importance of tools, or of the intellectual and emotional development that happens when hands, tools and materials intersect as creativity. 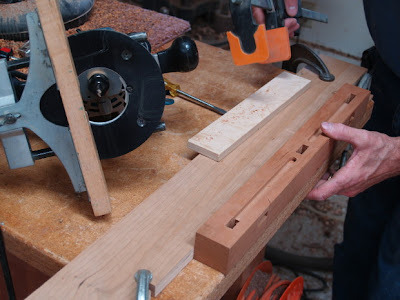 Next I cut table parts to length and then begin the process of cutting mortises. Over the days, and weeks tables will be made. Check back on occasion to see progress. What you see in the photo above is walnut and cherry shaped to thickness and width with the first ends squared on the table saw. All of these parts were cut from 8/4 stock using power tools. It is noisy and I make dust and the feelings that arise from it are well worth the mess. I have started making end tables and hall tables for a commission based on an old design from my distant past(about 1980-82). It seems that we may have good ideas when we are young, or at least may feel more experimental, being less knowledgeable about potential failure. So the table shown in the photo above serves as my inspiration for new work based on earlier designs. 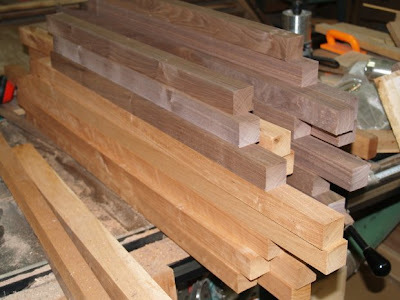 Today I am milling legs from walnut and cherry, and will dig into my stacks of wood for material for table tops and shelves. “The manual training school has done much to make the Arts and Crafts movement possible. I have no statistics for this statement; you do not need statistics for such things--you simply know them; you cannot go on teaching and training these young people for twenty-five years that it is right to do things that are worth while and not have some of them adopt the teaching”. If you study George LaKoff's works on metaphor, you begin to realize that all of our abstract intellectual components were originally based on real world experiences. We use metaphor to extend our conceptual range toward comprehension of abstract phenomenon. For example, Albert Einstein used his observations while waiting on passengers to arrive on a train to conceptualize the unique qualities of light. It was amazing to me as I was learning to sail over 30 years ago, how many everyday concepts and how much modern terminology was derived from the real observed phenomena and nomenclature of sending a boat forth through wind and water. Have you ever felt adrift? Perhaps this conversation will do that to you. I hope not, but that it helps you to better chart your course. One of the additional benefits of involvement in craft is the catalog of metaphorical concepts it provides through which to comprehend abstract thoughts. Then through involvement in crafts, one sets the pattern of examination, comparing by habit, conjecture with reality. I have this very clear notion that if we were still a nation of craftsmen and makers engaged more strongly in creative reality, our economy would be far stronger than it is now and we would be doing far less damage to the environment. Lena Woods is a Montessori school teacher and enthusiast who writes a blog Educating for Life that my readers may enjoy. Also, can daydreaming help to solve complex problems? Probably so. "In the days when the old apprenticeship system was most effective it was under the strict regulation of the gilds which were composed of master craftsmen, no journeyman or apprentice being admitted. In this respect they differed from the modern trade unions. When these gilds were gradually broken down by the development of the factory system, as they were in England, the regulating body of the apprenticeship system passed out also, for the British government was not prepared immediately to take their place..."
One thing you can see in the shift from apprenticeship to more modern factory technology was the rise of unskilled labor. That meant that employers no longer benefited from the advances in general intelligence and knowledge of their workers... Who gave a damn about lifelong learning? As long as they could insert tab "A" in slot "A" and not "B" by mistake, they could do the job and bring profits to their employers. Under the gild system, employers had responsibilities to train their future competition and thus encourage the rise of culture and community. I am bringing this up in relation to my earlier post in which I asked readers to consider the question of how to develop a rationale for corporations to take on the role of encouraging employee participation in crafts. It is odd, when I visit my daughter in New York to see such marked contrast between the financial district and the outer boroughs. You walk a few blocks from Columbia and you will discover the face of poverty. I believe that when employers no longer shared the responsibility for the intellectual development of their employees, we gained great efficiency at huge cost to our culture and our democracy. This is Father's Day. Beyond the immediate family, there once were "fathers of community" "founding fathers" who took an interest in community growth. Once those fathers were the same ones who brought employment and fostered personal growth. I believe that right now would be the perfect time to challenge employers to step up to the plate. I am lobbing slow pitch and if they give a damn or maybe two, they can hit right out of the park. And in the next couple days I invite my readers to comment. Brain storm with me. Share your ideas and then I will share a few of my own. "What the best and wisest parent wants for his own child, that must the community want for all of its children. Any other ideal for our schools is narrow and unlovely; acted upon it destroys our democracy." -John Dewey, quoted from Deborah Meier's website on school reform. The idea of “mixed age” or “undergraded” primary classrooms gained some national popularity in the late 1950s and sixties, then faded; it is once again being discussed as part of school reform. The pleasant, productive chaos of Rooms 13 and 14 at Franklin Elementary belied the boldness of Anne and Abby’s experiment, for what they were doing challenged one of the most widespread practices in elementary education: setting cognitive and linguistic benchmarks for children’s development. “Children just don’t learn to read or write or count or compute at the same time,” Abby said in exasperation. “There’s all kinds of normal variation. Some kids don’t really start reading until the second grade, and they go on to become fluent readers.” Yet the anxiety that can be generated when a child doesn’t hit one of these arbitrary benchmarks—especially among some affluent parents who attach great significance to such measures—is considerable and can lead to a range of remedial interventions, some more harmful than helpful. Through this year, students at Clear Spring School have been in classroom groupings of 1st and 2nd, 3rd and 4th, 5th and 6th, 7th and 8th, etc. This next year, we are changing to a Montessori grouping of three grade levels in each class. This nearly completely removes the pressures that result from having only a brief window for growth, allowing children to grow outwardly in response to inner development rather than as set by standards and external expectations. In many classrooms, if a child's development does not conform to specific norms, he or she may be viewed as lacking in intelligence or lazy and accept other's assessments of him or herself as such, when it is really the system that is at fault. I have told the story of Procrustes before. This post is one that I know my readers will find illuminating. This site has links to a number of famous and influential educational philosophers. By reading these, you might clarify your own. Feel free to comment and share your own thoughts. It is not too early to begin the celebration. Spend some time with your son or daughter in the wood shop and prepare for tomorrow. My earliest distinct memory of my dad was working in the driveway outside our home in Memphis. He was dripping sweat and stripped down to a sleeveless undershirt, and I was trying to learn to hammer without smashing my thumbs. Much later, when we were living in Omaha, Nebraska and he was managing a hardware store, he took an old Shopsmith in on trade and bought it for my 14th birthday. Nowadays, a father might give his son an iPhone, but 46 years later I still have the Shopsmith. With my care and use, it works better now than then. 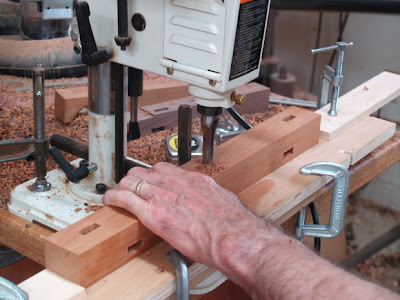 I use it as a drill press and sometimes as my lathe. When I use it as a lathe, I can still feel my Dad's presence, over my shoulders, his hands on mine, as I guide tool to wood. I will always be grateful that my father gave me the encouragement to work with my hands. My daughter Lucy is a third year student at Columbia and currently at Lamont-Doherty Earth Observatory for a summer internship in geophysics. When she was three I had a small table in the wood shop where she could take my scraps and glue and build things from her own imagination. We still have a small collection of those interesting objects. When Lucy turned her first wood on the Shopsmith, I stood over her shoulders, my hands on hers and sensing the presence of my own father over my shoulders, his hands on mine. No doubt a father sitting down with a son or daughter to play video/computer games makes memories, too. But it is hard for me to imagine anything finer to share nor lasting to the senses than working with wood. barnes and noble, where does it fit on the shelves? This morning, I had a conversation with a publisher, and of course the big questions are, "where would a book, Wisdom of the Hands, fit on the shelf? Which of the store buyers would be lured to buy it? and what would it's library, Dewey Decimal classification be?" Darn. The book doesn't nestle into any simple or direct categories. It fits so many. Self-improvement, education, psychology, philosophy, science and of course crafts. The hands literally touch and have shaped every aspect of human physical, emotional and cultural reality. So then the challenge becomes to determine which category it fits best, determining if there is enough of an audience that it can be published, and then hoping that there is crossover... That those who will most benefit from reading the book will find their way to it on the shelves. Anyway, great minds with greater experience than my own are looking at things and help is on the way. A friend sent me this quote from Anni Albers:"The inarticulateness of the artistic person is interpreted easily as a lack of intelligence while it is rather an intelligence expressing itself in other means than words. Our intellectual training affects our analytic--art work our synthetic ability. We are used to thinking of art work as developing taste or a sense for beauty if not as training artists. We think more of its aesthetic qualities than its constructive ones. But the constructive forces are the ones we will need today and tomorrow. We will have to construct, not analyze or decorate." Anni Albers was a weaver from the Bauhaus who with her husband Joseph fled Nazi Germany and taught at Black Mountain College. Interview query: what kind of nail gun? When Arkansas architect, E. Fay Jones was interviewing contractors for building the world renown Thorncrown Chapel, here in Eureka Springs, one of the questions he asked was, "What kind of nail gun do you use?" Of course, every contractor will tell you that Senco is the best, most reliable, and that their efficiency is based on it. But Jones hired the contractor who said, "I use a hammer." Is there an important lesson we can draw from that? Another good interview question is, "Do you fix your own car?" The answer has very little to do with auto mechanics, but it does tell about confidence, problem solving, and intellectual curiosity. Can you imagine hiring someone whose knowledge of the world extends only to what they have seen on-line or on television, or consists only of what they learned in the classroom? Of course not. The curiosity and confidence that it takes to fix one's own car is an expression of engagement in things far beyond popular culture and a willingness to commit to real problem solving. I am trying to do a bit of writing that will help American corporations understand why they need to support craft education. There are obvious mental health benefits from being engaged in creative "diversions," but I have been told that those mental health effects are not a compelling enough rationale. Corporations and human resource professionals want to know how crafts education will more directly affect corporate success. We make discoveries, understandably, when we are at the edge, when we have taken that first step outside the box. While I can't say whether or not Cray fixed his own car, he was regularly engaged in digging a tunnel from his basement to a nearby forest. Some might have considered such a thing to be an indication of insanity, but for Cray, it was the opportunity to do his most creative work. When the conscious mind is brought to clear focus on unrelated things, the unconscious mind is energized, bringing forth solutions to the challenges with which it had wrestled in vain. It is why they call what happens, "a brain storm," or a"stroke of genius." Providing the means and encouragement of employees to engage in crafts is an important means of professional development, and I hope that by discussing it, we at the Eureka Springs School of the Arts will be able to develop a strategy for engaging area corporations in support for arts and crafts education. It is one important way through which they can invest in their own success. Kurt Hahn, the visionary German expatriate educator and founder of Outward Bound, once enumerated the seven forces of decline that affect the modern world as follows: the decay of fitness, care, skill, initiative, self-discipline, imagination, and compassion. These all were functions of experience. Knowledge, community, and engagement with nature were threatened by 20th-century pedagogy, technology, and ideology --which, in the name of civilization, shielded or removed us from the true fores of life and the lessons contained therein. Hahn saw this decline as the path to "spiritual death." There is also a great editorial by Senior editor Tom Jackson. "Something gained by looking back" is about thrift and self-reliance, those qualities upon which lives, communities, and nations are constructed. These are qualities very much alive in the boat building community, and it is through thrift and self-reliance that skill evolves. Joe Youcha, a boat builder I've mentioned before, has a new blog devoted to "community boat building." The important thing to remember is that the process isn't just building boats, it is building lives and building community. In the words of Otto Salomon, "the value of the child's work isn't in the object made, but in the child." It is dark and cold for a morning in June and raining cats and dogs. The sky is as dark as late evening. So this morning, I am in retreat, doing things I've done a thousand times before and taking comfort in motions and procedures I know by heart. My friendly competition with the Chinese. I have many more complicated things I might be doing instead. But there is comfort during such a storm in simple things. Last week I found artist Eleanor Lux in front of her weaving studio, stringing beads, and thereby repairing a necklace for a friend. There were many more challenging things she might have been doing, but Eleanor told me how much pleasure there was in that simple work. Should it be called "meditation"? No, I'll not complicate it by making it something more than the pleasure it is. 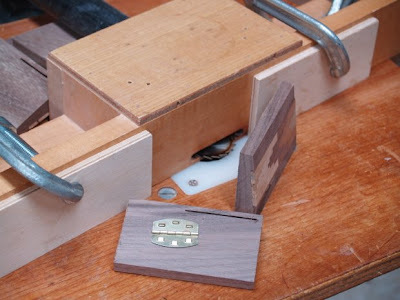 My photo above shows the simple process for cutting slots for barbed hinges. The set up is done by feel and by eye, and while it gives precision in the range that an engineer might measure at less than .001 inch on fit, no measuring tools are required. We have a tendency to think that without precise alphanumeric measuring devices, no precision is available to us. With experience, and practice however, even complicated processes requiring a high level of precision can become simple and mindful, like stringing beads on a slender wire. How to Design Furniture Special Edition. 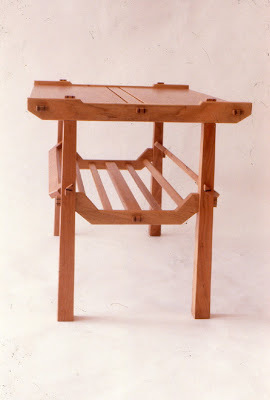 I was just notified that Fine Woodworking will feature my bench for Crystal Bridges in their "How to Design Furniture" special edition, which will go on the newsstands on July 1. The bench will be on page 6. Ed Pennebaker is what someone had called a renaissance man, meaning he can do nearly anything. Having mastered glass work, he has now turned his attention to casting bronze, adding one more layer of skill. I had a nice visit with Ed in his studio this afternoon. To find his studio requires extensive instruction as it is miles off the paved highway. The photos above show two of Ed's glass chandeliers, one in an outdoor setting under a canopy of wisteria. 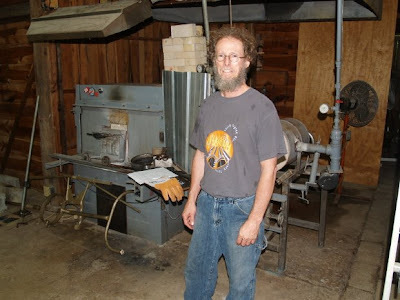 The photo below shows Ed with the furnace and glory hole, presently cooled and taking a rest from production. There are many ways through which the wisdom of the hands is expressed and many crafts to choose from. Ed does gardening, built his own home, does the photography of his work, produces it, and runs a very complicated business with one assistant. I asked Ed about the complexity of his business, and the challenging nature of his craft, and he assured me that you don't have to learn everything at once. My attempts in making artwork have been to work with the glass to show its fluid qualities and its interaction with light. I derive much on my inspiration from the garden and the woods surrounding my home and studio. The many seeds, buds, blooms, pods, and growing and developing plants and organisms continually amaze and inspire me. My latest sculptures like "Gone to Seed in the Crepuscular Landscape" and "Summer Blossom" deal with seeds/germination, flowers/seedpods, death/rebirth. I see my work belonging to a contemporary line of the "decorative arts" that developed from the arts and crafts movement where craftsmanship is of the utmost importance. Striving for the "perfect object" is the goal of the craftsman/designer and working directly with the materials at hand provides the greatest satisfaction for me. 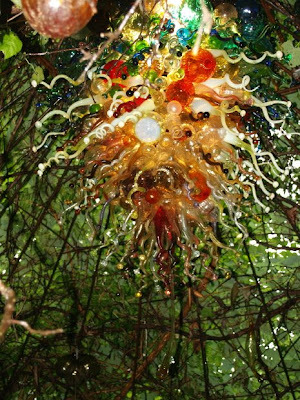 This afternoon I'll be visiting Ed Pennebaker, glass artist in his studio. You can see Ed at work in the attached video from youtube. or find him at Red Fern Glass Studio in Osage, Arkansas. Last night's opening at the Historic Arkansas Museum was fun, as I got to see the work by other notable Arkansas woodworkers. It is gratifying to see woodwork treated as art. On the other hand, to create work that has use beyond being decorative or culturally expressive is a matter that keeps a firm hand-hold on humility. The show with top billing, currently on exhibit at the Historic Arkansas Museum is a two person exhibition, one a graphic designer creating two-dimensional illustrations in copper and also in charcoal on paper. The other artist is showing sculptural forms in stainless steel. While their work was very interesting and well presented, I heard some comments that the furniture show was more interesting and should have been given top billing on the invitation. I won't immerse myself in the squabbles of relative merit of art vs. craft. There are no clear lines upon which one might choose sides. But, from a personal perspective, I like things that can be both beautiful and useful. And I was pleased to find my simple rustic chest on legs displayed in such a nice position in the exhibit. It is kind of a weird piece of furniture in some eyes, but if you get bored with it's appearance, you can still put stuff in it. Other artists in the exhibit are Keith Newton, Tommy Farrell, Lucas Strack, Whitney Patterson, and Mia Hall, and I was pleased to be included. 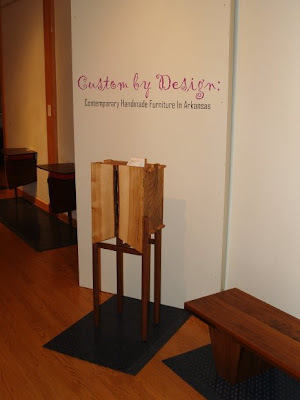 Today, I have little to contribute to the blog, as I am traveling to Little Rock for the opening of "Custom by Design," a showing of the crafted furniture work of 6 Arkansas artists at the Historic Arkansas Museum. 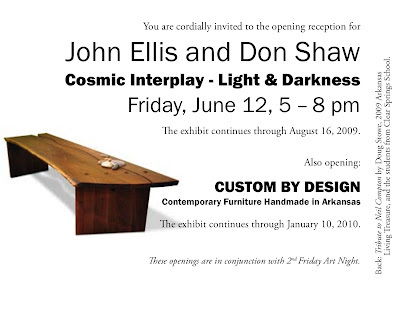 I have 6 pieces in the exhibit, including the Crystal Bridges bench and 5 pieces completed for my Rustic Furniture Basics book and DVD coming out in the fall, 2009. I will also deliver work to River Market Art Space and pick up a table for delivery to a customer here in Carroll County. In the meantime, I invite you as usual to pay a bit of attention to your hands. Watch how they learn to act unconsciously with skill, intelligence and wisdom. Then observe also the tools made for their use. Each, even the simplest is the culmination of thousands of years of human evolution in relationship to the materials of our creation. Our own lives are the product of accumulated knowledge embodied in our tools and the hands that and set them to work. Have fun in your explorations. Your invitation to tonight's reception is below. 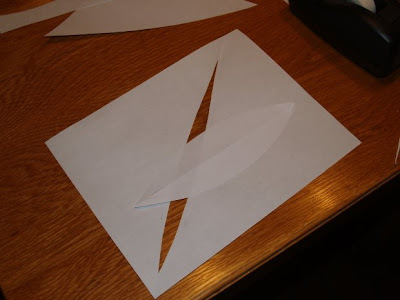 You can use cut paper to design a dory as shown in the attached photos. Of course, this is my first effort and I will get better at it, refining the shape in further iterations and learning from each one. It is cheaper and more efficient than starting out with wood. Next time I will use card stock so the material won't bend so easily. 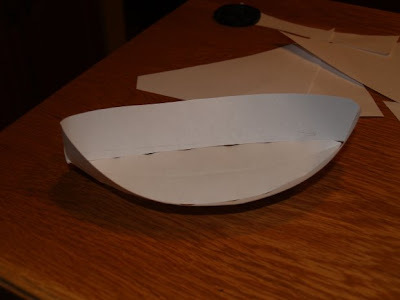 When the final shape is achieved, I will scan the bottom shape and one side, and these will be scaled to full size for making patterns for real boats. I have this very strange idea of making tiny little dories using cheap 2 cycle weed eaters as inboard propulsion. 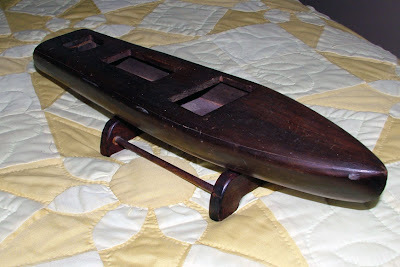 Having made one successful wooden boat, there is a greater danger that I may be inclined to make more. Just imagine a whole fleet of children in 6 ft. dories propelled by 2 cycle weed eaters. What a race that would be! I guess you can see that being inventive and inclined to make things can present a hazard to humanity. I had a conversation with a friend yesterday who lost his construction business and is now pounding nails. He says he has never been happier in his life... He says that despite the trauma of losing nearly everything the change has been very good. I can only wish that those who are still facing such losses find the grace and peace that my friend has discovered. We all know that our values are the true source of our pleasure and contentment, not the money we make, or the things we possess but what we are empowered to do for each other. However, those lessons are often not learned without some sense of pain or loss. In the news, it seems the rapid decline in the economy has slowed and things are appearing more hopeful to some. I am making small boxes which I will add to my inventory for fall sales, and today I meet with two customers about possible commissions. Those commissions in an uncertain economic time are very welcome indeed. I have been working to finish the first chapter and outline of my Wisdom of the Hands book so I can find a publisher. If the economy were better, i would be working on another how-to book, delaying my work on this daunting task. The collapse of the economy creates an interest in a reexamination of values and willingness to explore the contributions of our the human hands, so perhaps the time is right. Thrift is a forgotten American Virtue very much in alignment with Wisdom of the Hands. Templeton Press has published three books on the subject of thrift, Franklin's Thrift: The History of a Lost American Virtue, Thrift: A Cyclopedia, and Thrift and Generosity: The Joy of Giving and is attempting to restore a once traditional celebration of "Thrift week" through a website created to promote an understanding of this important virtue. Watch David Blankenship's commentary on the site. "Thrift in a way that 'cheap' does not, implies an element of human wisdom, of discernment..."
This morning I finally clamped all the hoses in place on my dust collection control box, so you can see how this fits into the system. I've been using it for weeks, and finding it saves me a lot of effort in switching from one machine to another in the system. 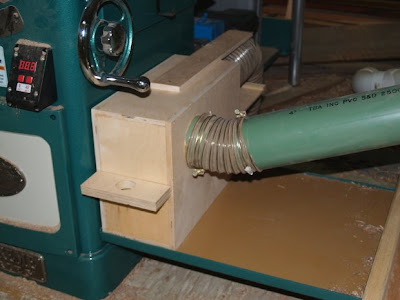 Many woodworkers use a system of slides turning off hoses, but that requires steps from one hose to another. 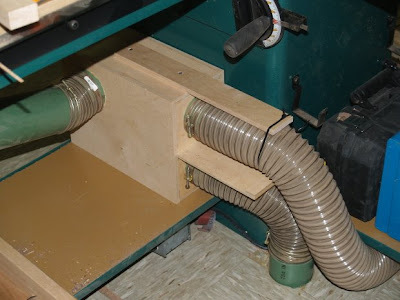 This control box has three positions from a single slide that open the table saw or planer or turn the line completely off to allow greater suction at other points in the collection system. An article on the making of this box will be featured in one of the national woodworking magazines. Which one? I'm waiting to find out. When I was a kid I wanted to be an inventor. I guess I am one. Sound familiar? If you read this blog regularly, you will recognize similarity to the Clear Spring School. Today, I am again engaged in my friendly competition with the Chinese, by making parts for small boxes. Also, I have meetings at Clear Spring School about planning and changes in the coming year. I have been struggling with the writing of the first chapter of the Wisdom of the Hands book, and the challenge is in keeping the tone light and fun to read. When we see what we are doing in the education of our children, the 30 percent of high school students who drop out in discouragement and frustration with school's seeming irrelevance, it is a bit hard to be upbeat, and yet, the hands are an interesting and engaging topic. With the exception of rare and tragic circumstances, we all have them, so every reader whether on-line or holding the pages of a real book have hands, and also fingers and thumbs, though in the woodworking community some may very sadly have fewer than normal. There is an important thing that our two ages of man have in common. We are rapidly moving beyond the manual age in which things were done by hand, to the digital age in which things are done by fingers alone, each with a special nesting place on each key. Next will be the age of the cramped thumb on tiny keyboard. Oh, my God, we are there already! We can call this new age "thumbal" as distinct from manual or digital, as the only key to admission will be a membership in twitter and some kind of hand-held thumbnal device for the input of 140 character tweets. Well, at least digits and thumbs are parts of hands, and perhaps you can see that the hands are still the driving force of human nature and creativity, even if things have become a bit cramped. Is this the destiny of man? To move from the broad motions of plane on wood to thumbs on tiny cramped keyboards? To move from a wide ranging creative engagement to tweet? I am reminded to take a deep breath. Let the chest and diaphragm expand to their full dimensions. Thumbs on tiny keyboards tend to restrict the full breath and dimensions of our humanity. I'll remind that Abraham Maslow said that if the only tool we have is a hammer, then every problem looks like a nail. My own addendum: If the only tool we have is a hand-held thumbnal input device, designed and created by others, our only response will be to meekly tweet calls for help expressing hopelessness and despair. This may be a wider mental stretch than many of my readers will welcome. But I remind my readers that all knowledge is based on observation. Can we so easily discount the observations of others? Jonathan Baldwin Turner was the founder of the University of Illinois. 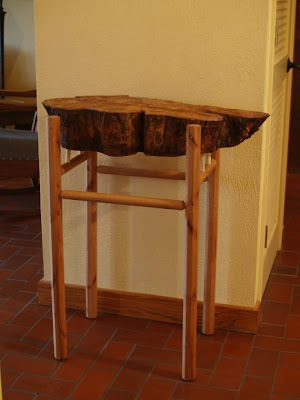 I have just been informed that my stump table from my Rustic Furniture Basics book has been purchased by the Historic Arkansas Museum for its permanent collection. It is nice when my work finds its way to a good home. 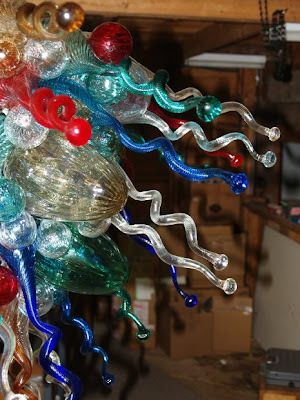 The making of this piece is illustrated in the new book and the table will be on display at the Historic Arkansas Museum until January 2010. Here is an exercise in practical problem solving. I have a tough time getting the lids off our trash cans, but possums seem to have no trouble at all. It may have something to do with the relative size of our hands and fingers. A wild varmint had been toppling my trash cans each night, popping the lids and littering the ground with our trash. To keep the trash cans from being toppled, I braced them with saw horses, hoping that by keeping them upright, the trash would be safe from being scattered. Instead, I created my own low-tech live trap. This morning as you can see in the photo, I captured a possum of my very own, and a dilemma. I could feed the possum to the dog, knowing that the dog would be at greater risk of injury or mortality than the possum, or I could close the can and haul the thing to a release point miles from home and hope that this particular wily possum doesn't find its way back. 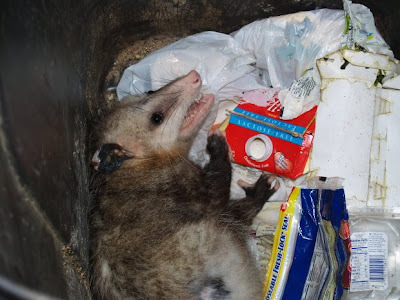 Can you imagine hauling a possum in a garbage can in the back of my Subaru? 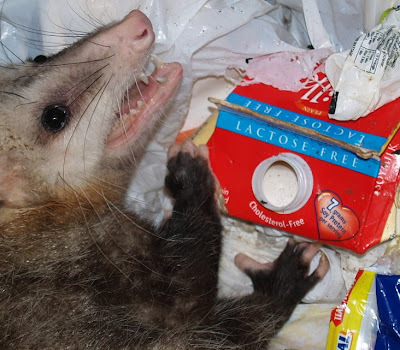 This being a possum with particular skills at popping the lid off? I am thankful for duct tape! I sealed the can with strips of tape and hauled my fuzzy friend miles from home with hopes that he finds more hospitality in forests far away. If you look in the photo at the possum's hands you may notice that he's not a dumb critter but has thumbs and fingers similar to our own. My earliest clear memory of my father involves my hands, which may come as no surprise to those who have observed their own close integration of hand and mind. It was hot and we were working outside in the driveway at our home at 1700 Faxon Avenue in Memphis Tennessee. Dad was stripped to a sleeveless undershirt, dripping sweat in the dense humidity and was working on a redwood fence of his own design as a divider between the driveway and the back yard. I was about 4 years old, "helping" and learning to hammer my first nails. In driving nails, there are 2 important lessons. I clearly remember Dad instructing me in one, and the other I learned later when teaching first and second grade kids at the Clear Spring School. Dad's instructions were to hold the hammer at the end of the handle so that the full effect of gravity would give greater force to the blow. The more natural way for a child to hold a hammer is close to the head as this most closely approximates the motions of the hand itself, but gives a rather puny strike having little effect. It takes time, strength and practice to move the hand down the length of the handle giving greater speed and force to its use. I watch this process repeated each year as new students begin their relationships with woodworking tools. The hammer head, as an extension of the human hand grows out in distance and striking force with practice as the grip recedes from the head toward the handle's end. The second lesson is one Dad had not known to teach me but which would have helped me avoid the injuries to my thumbs and fingers that came that first day. 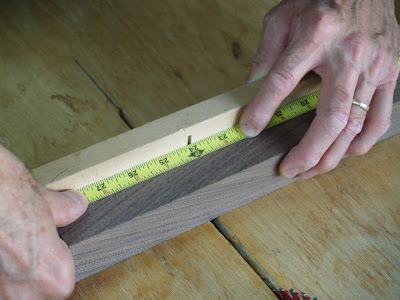 This lesson involves where to hold the nail as you start it in wood. 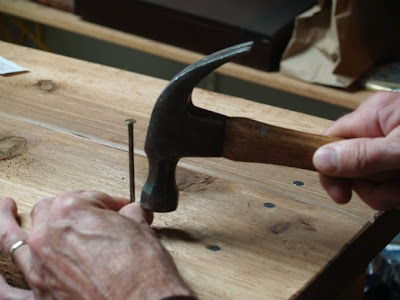 If you hold the nail in the most comfortable and seemingly safe place, down by the tip and away from where the face of the hammer will strike, when you miss (and as a beginner you will), your fingers and thumb are crushed between the wood and the face of the hammer. If you've tried it you know it really hurts, and that may be why my memories from that first day are so clear and precise. On the other hand, if you hold the nail close to its head, near where the hammer will strike, when the hammer misses (and it certainly will) your fingers are brushed aside by the hammer face rather than being smashed against the wood. 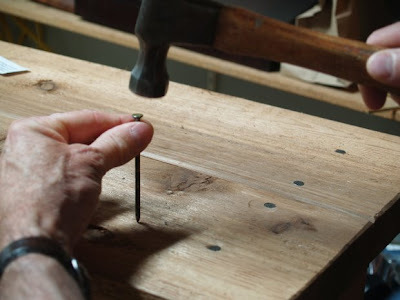 This lesson of holding the nail at the head is particularly useful to me now, as I confidently hold nails as children make their first unpracticed attempts with a hammer. I know you will get the idea from the photos below. There is a simple lesson in this. Close observation and application of intellect can prevent injury to our thumbs. Human beings throughout hundreds of thousands of years of evolution had been dependent on accurate observations of their natural environment for survival. While we think of science being newly derived, accuracy of scientific observation is not. Knowing where food could be found, knowing how and when to take shelter from dangerous circumstances, and knowing how to make the objects necessary for subsistence and safety, were crucial factors that no single individual could ignore. Today, we can live in the shelter of our homes and offices, surrounded by objects manufactured by others, without a thought to the weather outside, and without regard for the external consequences of the choices we make in living our lives. These circumstances allow us to live completely out of harmony with the natural environment without ever knowing that we do so, and without ever anticipating that we or future generations of our kind will pay a price for it. We might feel far superior to the men and women who walked the earth hundreds or thousands of years ago, but they lived in harmony with the natural environment in a sustained symbiotic relationship dependent on acute attention and skilled observation. At this point, in comparison, we live thoughtlessly, with our minds wrapped in meaningless internal dialog which we escape only to enter the unreal worlds of computer screens and television. At one point, in the early age of science, British Admiral Sir Francis Beaufort developed a scale with which any common seaman could take useful measurements of wind velocity based on directly observable phenomena. Through the use of the Beaufort scale, the British Admiralty gathered an incredible amount of data enabling safer navigation of British ships throughout the world. The Beaufort Wind scale was an example of a framework for scientific investigation that had the potential of directly increasing the part played by the common man. For those not at sea, there is a land version that allows an observer to note the wind velocity based on the movement of leaves, branches and trees, or simple things like the way the smoke rises from a chimney. The wisdom of the hands is an invitation for academics to move beyond the purity of intellectual academic pursuits and to the tradesmen, craftsmen and common men and women of the world to move beyond the motions of the purely mechanical toward a renewed primacy of direct observation, and recognition of the value of one's own direct perceptions. This week I am cleaning my classroom, making boxes, and attempting to complete a writing assignment... not an assignment from someone else but for myself to further my Wisdom of the Hands project. There is a simple lesson that a craftsman learns from experience about order of operations. Do the hard part first. For example, if I were to do a piece of carved furniture, held together with dovetailed joints, and dovetails were hard for me and the carving easy, I would do the dovetails first so in case I was to mess up badly requiring the replacement of materials, I at least would only be discarding and starting over only the dovetailed materials and not the carving that I had invested so much time to complete. Taking care of the hard part first is a reasonable maxim for other things too. For example, in writing about the Wisdom of the Hands, the hardest part is dealing with the 800 pound sore thumb in the room. We have had many long years of animosity between social classes based on whether a employment is considered to require primarily hand skills or academically derived knowledge. I strongly suspect that whatever I say may be regarded by some as anti-academic. On the other side, when I had my first job outside employment in my father's hardware store, loading railway cars at a gravel pit, the older men called me "college boy" with a derisive tone, until I had proven myself through hard work climbing in and out and patching railway cars 72 hours per week. So, help me here as I wander around a difficult subject and as I address the hard part first. We all know the term "purely academic" and what it means is that the idea is purely hypothetical and not to be tested against real circumstances. The way of the craftsman is completely opposite pole from "purely academic." What we do at the very core of our method of operations is to test things in real life. For example, a lump of clay on a potters wheel is first tested for proper moisture content, a thing the potter feels in the texture of the clay, by squeezing it and comparing with past experience. He or she then centers the clay on the wheel by compressing the spinning clay tightly in both hands. Then the thumbs are inserted at the center of the spinning form and the two hands working in perfect harmony manipulate the spinning clay to the desired shape. With practice, this task can become purely mechanical, freeing the mind to wander as the hands, arms and body manipulate the wheel and the clay, even knowing when to add water to lubricate the hands, without ever having the mind called back from its wandering, unless of course the attention of the hands wanders too far, the clay goes out of center, the pot begins to collapse and the spinning form calls the mind's attention back to make the assessment whether or not the pot can be saved. "The final object to be attained, with the industrial class, is to make them thinking laborers; while for the professional class we should desire to make laborious thinkers; the production of goods to feed and adorn the body being the final end of one class of pursuits, and the production of thought to do the same for the mind the end of the other." The education of all hands is required to accomplish this noble goal. My explanation will go a bit deeper tomorrow. Please feel free to ask for clarification if some of this seems obtuse. My goal is to make my case for hands-on learning clear regardless of social and economic class or academic standing, and I suspect that may not be an easy thing to accomplish, at least not while there is an 800 pound sore thumb in the room.